When you think of Madrid, you no doubt think of all the things that are expensive and sophisticated - classy restaurants, designer clothes stores, flashy cars, and luxury hotels. It is certainly true that Madrid is a city that offers the wealthy a whole other standard of living - a standard that affords those who have the cash the very best in life. And nowhere is this better exemplified than in the many first class hotels around the city. Last, but by no means least, no description of Madrid's finest hotels would be complete without a mention of the Hotel Ritz. Located right in the centre of Madrid close to the Prado and Thyssen museums, but with splendid terraces and gardens for its guests, this stately hotel has provided luxury and comfort over the years to the rich and famous. Apparently the hotel at one time didn't allow actors to stay within its premises. Legend has it that on trying to get a room here and being told this, Victor Mature promptly replied "You think I'm an actor? You obviously haven't seen my latest movie!" There are certainly other good hotels in Madrid, many of which have five stars, but those listed here are particularly outstanding for their quality rooms, exceptional service, and easy to use facilities. 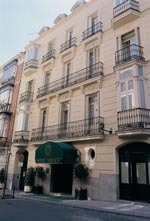 A stay in one of these hotels is sure to make your stay in Madrid the best it can be - unforgettable.